Have you lost data already this year? 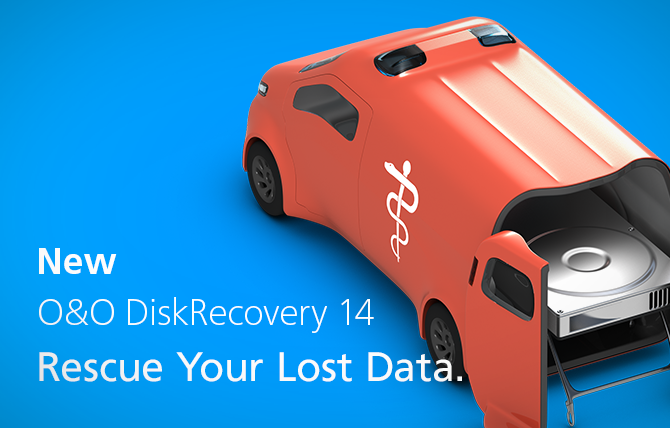 O&O DiskRecovery 14 searches for and reconstructs data that was deleted or lost through software error. It scans the entire hard disk, partition or USB Stick for lost files. Usage is very intuitive, with a step-by-step wizard enabling users with little or no experience to easily recovery data they feared was lost. The free trial version lets users see before they buy just what lost data is in fact recoverable! O&O DiskRecovery 14 can recognize over 400 file types and versions in total, for instance Microsoft Office 2019 documents and picture and video files. Read here to find out why our customer Erlenbach Radiology opted for O&O over the competition, and how O&O DiskRecovery came to their rescue! O&O DiskRecovery functionality begins where other programs leave off. This software combs every sector of a hard disk, memory card, or digital camera to find lost files. Even when files systems are formatted or destroyed, it is possible to reconstruct once deleted data. Over 400 file types and versions in total can be recognized and restored, including Word documents, Excel workbooks, Access databases, and virtually every sort of commonly used graphics, photo, movie, and music formats (JPEG, AVI, MPEG, MP3, WAV, BMP, TIFF, Corel Draw, Photoshop, Framemaker, Adobe Illustrator, and many more). O&O DiskRecovery in an emergency! Data recovery with the O&O DiskRecovery 14 Instant Version can be carried out without overwriting important data. Installation is done over a second computer, and the program files are made available on a portable disk or in the network. The start medium also contains O&O system recovery programs that are able to access the Windows Registry or files that have been saved. These programs make it possible to recover data even on Windows systems that are defective or no longer able to start. Look at it this way: if you cut yourself badly, do you first then run to the pharmacy for plasters, or do you have some in stock just in case?! O&O DiskRecovery 14 is published in three editions: the Professional Edition for home users, the Admin Edition for use per Administrator on server systems and any number of company machines, and the Tech Edition for companies offering data recovery as a service to customers. The Admin and Tech Editions will be released shortly.